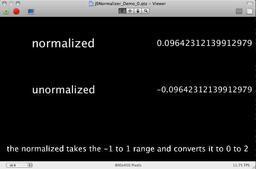 This virtual macro takes any input between -1 to 1 and normalises that number range to be between 0 to 2. This is useful when one is feeding dynamic data of such a range that one wishes to visualise using objects that do not much appreciate negative numbers. Thus one can stop one source of sig exec faults before they ever start. To convert a range -1>>1 to 0>>2 , you just add +1. So why a JS macro ? Help with math calculation. Keeping the particles emitter on the stage.